I can't believe it's Monday already. Where did the weekend go? This past Friday was sunny and it was... not warm but also not frigid and I was suffering from a massive case of spring fever. 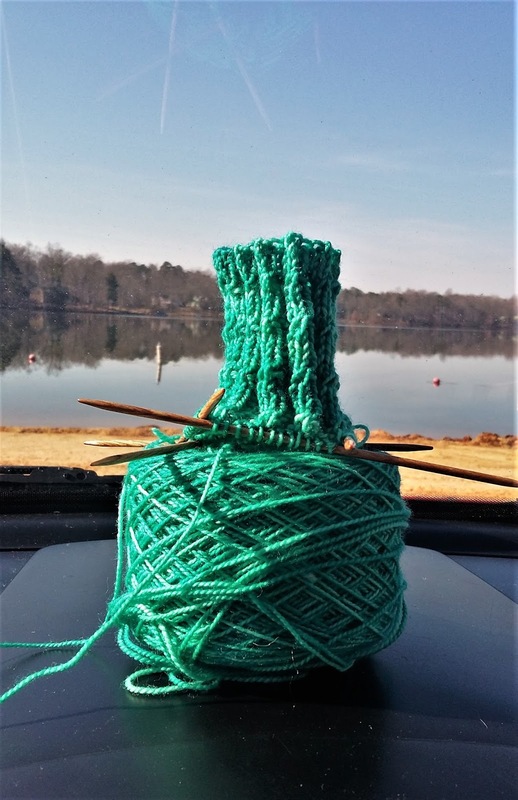 I drove over to the lake with my knitting bag riding shotgun. I planned to spend a few hours enjoying the view and the sunshine from the interior of my car. 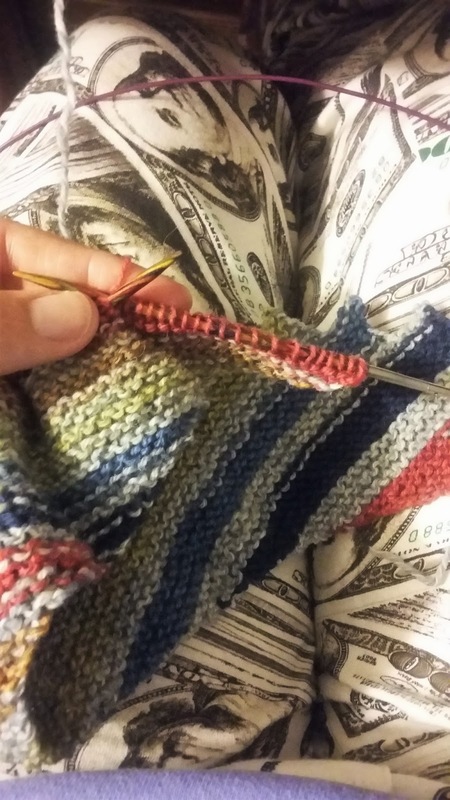 But as soon as I'd pulled out my knitting, I got the call that a relative was sick and needed help getting to the doctor's office. I snapped a quick photo just to prove I'd been there and hit the highway. And that was the end of knitting for the day. I didn't get much knitting done Saturday either. I intended to catch up on email and blog reading. It is amazing how quickly I fell behind since Sarah began taking my computer with her to school three days a week. We really, really need to do something about that situation. But I digress. About the time I hit the Gmail button on my computer, Mike announced that he was going to start eating healthier and that he thought we needed to cut our carb intake. I mentioned that I'd been trying to eat nothing but lean meats and vegetables for the past several weeks. He thought that sounded like a fine diet and suggested we go to the grocery store to stock up on fresh vegetables. Seeing as though this was the first time in our 24+ years of marriage that we were in agreement about our diet, I quickly closed my computer and off we went. So once again, not much knitting or email reading got done. Sunday was a knit filled day however. It was one of those glorious cold, rainy days where you just want to stay in your pajamas, snuggled up under a blanket and knit and read and drink hot tea all day days. And so I did. In my money-pants pajamas. Don't judge. As ridiculous as they look, they are ridiculously comfy. Hope your relative is doing okay and feeling better soon. Thank you! She's much better now. Glad you finally got some knitting time this weekend ;-) Your Sunday sounds like a good one. Sunburn is the worst! Hope you were able to get lots of knitting done while you recovered. We're doing really well with our vegetable intake. Yay! Gosh, I wish I could sew with fabric but it is Not one of my talents. Family member's good now. Thanks! And that lake looks the perfect scenery for knitting! I would have loved to stay in and knit on Sunday because it was snowing! But I had theater tickets with my mom, so I got dressed and went out. Handwork by any water is wonderful. I think I'll use Makers' Monday as a weekly progress report. Great! Hope you'll join us every week.